How time flies. Watching Cynthia Diaz at this year’s Centro Guerrero convocation at the University of Arizona brought back memories of when I first saw her. I did not actually meet her at the time. 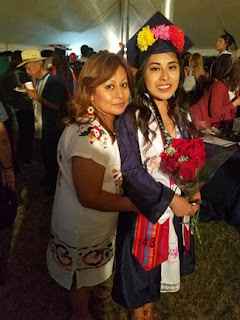 I first saw her on an “I miss my mom” poster when she was 15 and fighting in Phoenix to bring her mother back from Mexico as she had been inhumanely deported (whisked away from her home under false pretenses at the crack of dawn) by the migra that year. The next time I saw her was at UA. She told me that a mutual friend had sent her my way. This was the fall of 2013. At the time, she still looked the same age as the young girl in the poster.